I’ve stopped being surprised at the genres getting mashed together these days – especially those created at Ludum Dare events. Developers seem happy to just try things, like musicians from different styles having a jam session. Sometimes they succeed, creating an unexpected sound we still appreciate on a track decades afterwards. Sometimes they produce an album we later pretend we never bought. 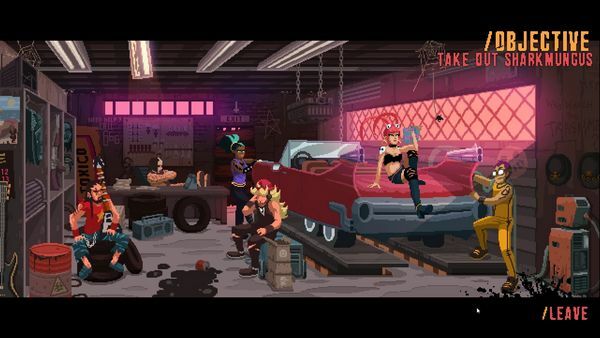 Double Kick Heroes, initially created for Ludum Dare #34, offers more of the former, but with a little dash of the latter. 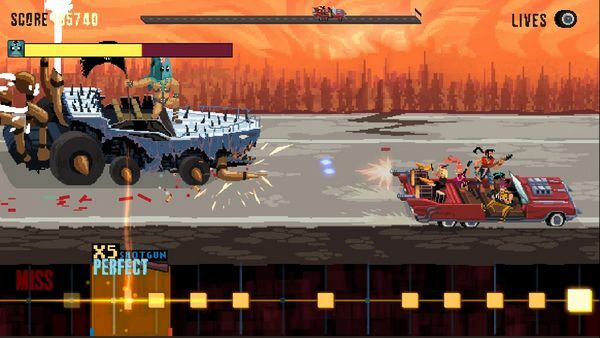 As a game, Double Kick Heroes fuses zombie blasting with rhythm game. A strange mix? As the music is all heavy metal it marries with the undead theme a lot easier – think of all the classic bands and albums using imagery of death and the reaper… though these usually tried to be very serious with it, which this game most definitely is not – let’s just say that the volume settings go to 11. The eponymous band, having been deep in rehearsals, get on stage at a concert to find their audience is zombified and out to savour something other than the band’s music. 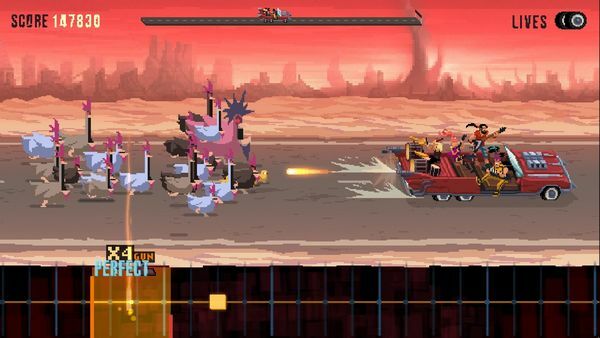 Cue them jumping into a modified Cadillac, rear mounted guns linked to the double kicks of the drummer’s kit, and an on-going race from the surprisingly speedy horde, as well as mutants, road warriors, homicidal chickens… It’s silly, in all the right ways to be fun. If you’ve played a rhythm game before, the basics will feel pretty familiar, with a prompt bar running along the bottom of the screen telling you when you press buttons in time with the audio track. Except, it is done a little differently here. The double kick refers to the two foot pedals the drummer can use, and you’re given two buttons for this which equate to firing an upper or lower gun (the left or right of the car, as it’s viewed on screen). All good and well for clearing zombies, though these buttons can be used interchangeably – either will count as a correctly played and timed beat. This does make sense, and at points the pace of the music ramps up fast enough that simply mashing one button isn’t enough – you need to alternate, just as a real drummer would. But a lot of the time you have the chance to choose which one to press… and this is a mixed blessing. It turns out that during the zombie apocalypse, even getting a chicken dinner is a life-or-death situation. The problem here comes from needing to keep an eye on the car, and more specifically where the zombies are approaching from – high or low. Except, as a rhythm game, you’re actually focusing on the timer bar at the bottom, and it takes a switch in concentration to move attention from one to the other. This gets extra confusing when you move up difficulties too, where you’re having to decide which button to use while also timing presses of other instruments (buttons). And then you may also be needing to steer the car around the road to avoid boss attacks. It’s a lot to pay attention to. I’m not going to say it’s impossible, but it does raise the level of focus and timing needed to a very high standard, and it’s without much shame that I say I had more fun, not to mention success, keeping the difficulty low. Beyond the controls, though… well, the other important element of any music-based game has to be the music itself, and Double Kick Heroes does well here, with a selection of tracks covering various metal and rock styles; and if they don’t please you – which, as an old metaller, I’d hope they would for you as much as they did for me – then you can also import your own tracks, and edit the timing sequences to play yourself, as well as download other people’s sequences they’ve mapped out. Given that the game has been released into early access today, there is also the room for things to change before a full release in the future; certainly, it’ll be interesting to see there are any tweaks to the controls, or if my struggles with coordinating between button choices and focusing on various areas of the screen are just me. But even facing that challenge, it does say something that I’m still intending on going back and trying again – for the music, the humour, and the hope that I’ll suddenly gain the timing to stay competitive. But largely for the music. Double Kick Heroes is released into Early Access on Steam today (11th April).